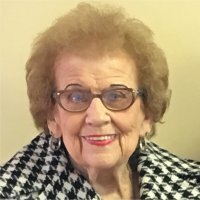 Betty J. Bastian, nee Gaines, 92, of O’Fallon, Illinois, born Thursday, November 11, 1926, in East Saint Louis, IL, passed away Monday, January 28, 2019 at Lebanon Care Center in Lebanon, Illinois. Betty worked for 30 years at Scott Air Force Base for the Air Weather Service, Air Force Communications Service and Defense Electronics Communication Office. She was a graduate of East St. Louis Senior High School class of 1944. She was a member of St. Michael’s Episcopal Church, O’Fallon, Illinois. Memorials: Memorials may be made to the St. Michael’s Episcopal Church. Visitation: Visitation from 4:00 pm – 8:00 pm, Friday, February 1, 2019 at St. Michael’s Episcopal Church in O’Fallon, IL. Funeral: Funeral Services will be held at 2:00 pm, Saturday, February 2, 2019 at St. Michael’s Episcopal Church, with Father Ian Wetmore officiating. Interment will follow at Lake View Memorial Gardens, Fairview Heights, IL. I’ve only gone to rest a little while. not as I am now, but as I use to be. Understand, in your hearts, I’ve only gone to rest a little while. Pure definition of a lady. I loved to hear her laugh and she was always dressed to the nines! She will be missed.